Elizabeth “Liz” Koehling ’15 is one of two athletic training students selected to represent District III (DC, MD, NC, SC, VA, WV) at the 2014 Student Leadership Workshop by the Institute for Collegiate Sports Medicine in May in Long Beach, Calif.
Liz had to go through a rigorous application process, as well as, write essays about leadership and ways to improve the athletic training profession. “This workshop allows Liz to interact directly with current and previous leaders within the field of Athletic Training (NATA presidents, top researchers, NATA Hall of Famer, etc),” said Debbie Bradney, department chair for athletic training. “The point of leadership is to notice problems and make changes,” Liz said, adding that in her chosen field, the name is a problem. Athletic trainers bristle if you call them trainers, which she said implies personal trainers. “I call myself an emergency physical therapist to most people who don’t understand,” she said. 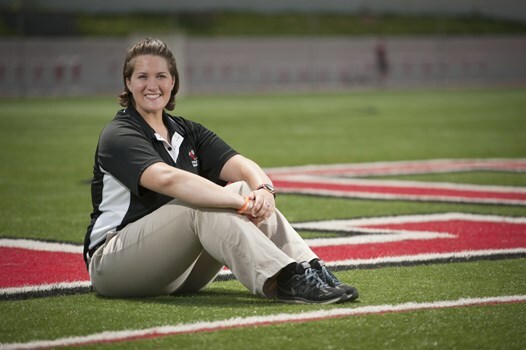 Liz says that rest and time management are important for athletic trainers, just as they are for athletes. She was drawn to athletic training for a number of reasons. “I’ve always had a passion for the human body and how it works and how it moves,” she said. Like many students majoring in athletic training, Liz suffered from injuries as a high school soccer player and dancer. “I’ve had three knee surgeries,” she said. Liz likes being able to help athletes. One of the most rewarding aspects is that “I can either reduce their pain or take their pain away, even if it’s as simple as stretching or massage,” she said. This summer, Liz has an internship with the US Naval Academy in Annapolis, an easy commute from her hometown of Columbia, Maryland. She said another LC student helped her pursue the internship. She said Dr. Bradney and Dr. Pat Aronson have been great advocates.